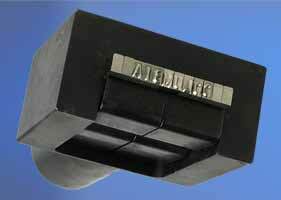 Flat type stamps are held into a holder with a set screw. This method is recommended for use only in applications with smaller forces, and minimal machine vibrations. Step style stamps are held into a holder with a plate or clip. This method offers very easy changing of the marking legend. The height (B) and the length (C) of the stamp will remain the same. The width of the stamp (A) will be the single character width multiplied by the number of characters on the stamp. 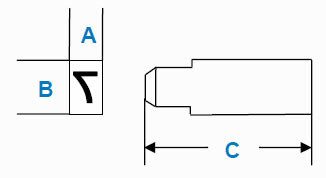 Multi-Character stamps are easily ordered by extending the part number to include the “L” logo segment prefix and “C#” denoting the number of characters as the suffix.